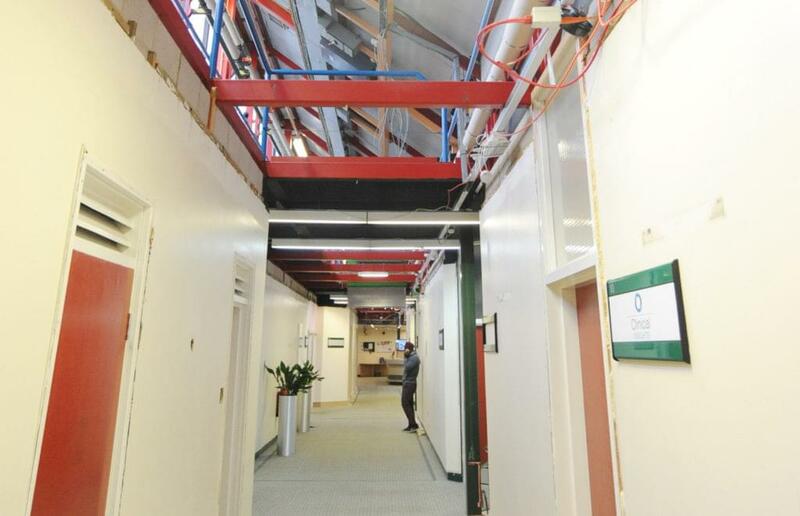 Tenants at the Venture Centre are set to benefit from refurbishment works – inside and out! The upgrade of the building will mean visual and energy-saving improvements and will be followed by the refurbishment of the exterior car parking area to address the occasional bottleneck issues that have been seen in recent months. The internal refurbishment, which started in June, will see an obvious transformation of the corridors and reception area. The upgrades in the corridors include new flooring and ceilings, plastering walls, changing doors, skirting and architrave. Existing lighting will be replaced with new LED lighting. The reception will be repositioned as well as replacing the doors and screens to the inner entrance vestibule and the bottom of the stairs. Further works include the upgrading of the electrical distribution boards to the common areas and replacing all of the tenant electrical meters. The interior works are scheduled for completion in early October. Following this the car park will be re-laid while the approach to the building will be remodelled and car park lighting will be improved with new LED fittings. Brian Nee, of the University of Warwick Science Park, said: “The works are designed to cause minimum disruption to our tenants.